Are you looking for a way to relax and have fun at the same time? Paddle boarding is an exciting individual sport. There are many different brands of boards available with different qualities that can make the choice on what to buy a hard decision. One of the best choices you could make would be the Zray X1 inflatable Paddle Board. Read the complete review for all the details on this great product. Supports beginner riders as well as experienced ones up to 264 lbs. Easy to carry and store: One of the greatest advantages of owning an inflatable paddle boards is the ability to store it about anywhere. When it is deflated, you can roll it up so it is the size of a sleeping bag. This company provides you with a backpack for storing your paddle board in. This backpack makes the transport to and from the water an easy task. The Zray Sup, is constructed of high quality, military-grade material on the outer skin with a thickness of six inches when inflated. This type of material is extremely resistant to scratches and scrapes when coming into contact with rocks, the roof of your vehicle, and most other hard surfaces you may encounter in the water. Even though the construction material is high quality, the board is rather light weighing in at just 16.3 pounds. This would be a good board for smaller adults, teenagers and children as it is only 9’9″ in length. The 6 inch thickness is one of the main safety features. The board will remain stable while you are paddling and your feet will stay fairly dry . It has special wear resistance and skid resistance material on the top of the board and this EVA product allows for ease of movement. There are D-rings on the deck which will allow you to haul a small amount of cargo and not have to worry about it falling into the water. The Zray X1 is designed for comfort as well as durability. The paddle has a special soft handle which will give you hours of comfortable paddling and fun. If you get tired, brake out the suntan lotion and lay down on your board and get a perfect tan. Since it is so stable, you could even practice your yoga on it. The deck of this board is nice and wide and stable. The accessories that come with the inflatable sup are, a backpack, central fin, an aluminum paddle, a pump and a seat. The aluminum paddle has three different extension lengths and it will float if it is accidentally dropped in the water. Additionally, you will get a waterproof phone case as a gift. Be prepared to enjoy your inflatable paddle board as it will feel very similar to one of the hard boards. Make it a point to explore all of its features in detail before making a decision. Since everything that you will need to get started paddle boarding comes with this board, there will no need to shop any further. Take it out of the box, inspect it for and damage, inflate it and take off for the wild blue ocean. Easy to assemble, it takes about 5 to 10 minutes to inflate. The Zray X1 paddle board is an excellent pick for beginner to intermediate paddlers. It is one of the top rated boards because of the great features that it offers to the users. This would be a smart investment on your part and it would be a one time purchase in your life time unless, you liked it so much you purchased another one for the family. 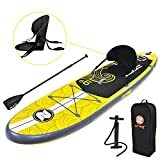 Want to know the price of Zray X1 Paddle Board, check it on Amazon!